A new research report published by Transparency market Research on the global luxury goods market states that the rising number of high net-worth individuals across the globe will drive this market despite the economic turbulence. According to the market research report, titled “Global Luxury Goods Market - Industry Analysis, Size, Share, Growth, Trends, and Forecast, 2014 - 2020”, the global luxury goods market is expected to grow at a CAGR of 3.40% from 2014 to 2020. The rise in the standard of living in developing countries is one of the important factors propelling the global luxury goods market. In addition, the powerful marketing campaigns through ubiquitous digital media platforms, especially in the travel retail industry, are also contributing to the growth of this market. According to the global luxury goods market research report, this market was valued at US$296.1 bn in 2013 and is expected to reach US$374.8 bn in 2020. 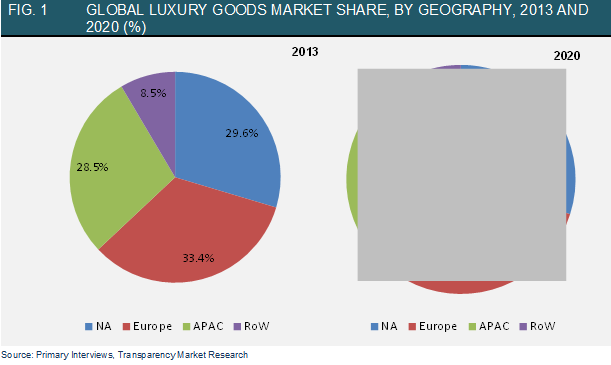 The global luxury goods market has been segmented on the basis of type and geography. The types of items sold in this market are apparel and leather goods, luxury watches and jewelry, luxury personal care and cosmetics, fragrances, wines or champagne and spirits, and others such as luxury pens and tableware. Geographically, the global luxury goods market is segmented into North America, Asia Pacific, Europe, and the Rest of the World. As per the current market scenario, the leather goods and apparel segment has a lion’s share in the luxury goods market, followed closely by the luxury watches and jewelry segment. However, the watches and jewelry segment is likely to grow at a fast pace, especially in emerging markets, by the end of 2020. As luxury goods manufacturers are creating items that combine luxury and affordability, they are set to witness a surge in the demand for all product segments of the global luxury goods market. However, the global luxury goods market is faced with tough challenges such as currency devaluation, unstable economic scenarios, and issues pertaining to catering to the newly affluent class of citizens in developing economies. The other notable problem in developing economies is the dearth of luxury goods outlets, which are an important medium for the consumers to fulfill their demand. Major companies competing in the global luxury goods market are Compagnie Financière Richemont S.A. (hereby referred as Richemont), Hermes International S.A., LVMH, Prada S.p.A., Kering Group, Coty, Inc., The L'Oréal Group, Rolex S.A., and Tiffany & Company. The industry experts opine that these companies must sell a mix of premium and affordable luxury items to acquire a wider range of customers across the world. The research report on the global luxury goods market profiles these companies and gives a detailed explanation of their financial status, research and development activities, the list of existing products as well as those in the pipeline, investment outlook, and business and management strategies.